Ubiquiti NanoBeam 5AC 19dBi NBE-5AC-19 5GHz Airmax AC Bridge CPE (2 Units), Nanobeam ac High-Performance airMAX Bridge directs RF energy in a tight beamwidth 802.11ac up to 450+ Mbps. 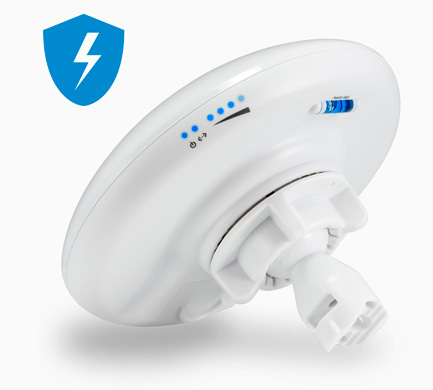 The NBE-5AC-19 NanoBeam ac High-Performance airMAX Bridge from Ubiquiti Networks directs RF energy in a tight beamwidth. It maximizes and improves noise immunity by its uniform bandwidth and also blocks or spatially filters out noise. This feature helps in areas crowded with other RF signals of the same or similar frequency. Using airMAX 802.11ac technology, this nanobeam supports up to 450+ Mbps throughput in a small form factor. 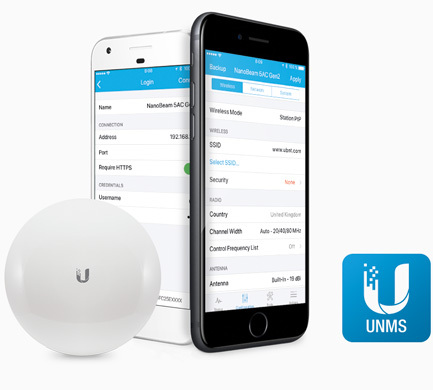 It launches with PtP functionality, however client mode feature can be added with a firmware upgrade from Ubiquiti. The radio includes a protective radome cover to shield it from the environmental elements.